Okorocha warmed that,”Chief Hope Uzodinma is not a member of APC in Imo State. His purported membership of the Party was announced in Abuja. He has never attended any APC meeting either in his ward or in his Local Government, Oru-East or at the State level. And that is why no APC member in the State was excited when the Party’s National Chairman, Comrade Adams Oshiomhole announced him as his preferred governorship Candidate of the Party in the State.” The governor claimed that, “APC members in Imo see Chief Uzodinma as still a staunch member of PDP and that was the reason behind the dead silence in Imo over the announcement of his name as the governorship Candidate of the party. If Chief Uzodinma was to be a known member of the Party, there would have been celebration in Imo. The Chieftains of the Party in Abuja backing him are elite Politicians who have no relationship with the grassroots. “Governor Rochas Okorocha won his election in 2011 on the platform of APGA through the ballot box. Ditto, in 2015 on the ticket of APC. And in the two cases, the parties were not in Power at the Federal level. “So, he did not enjoy any Federal might. Imo people voted for him for whom he is. And the love is still intact. In 2011, he defeated an incumbent governor of PDP extraction and in 2015 he also defeated a sitting Deputy-Speaker of the House of Representatives also of the PDP stock. How else do you measure popularity? “In the case of Chief Uzodinma, the story is totally different. In 2011, he took the Senate Seat for Orlu zone from Chief Osita Izunaso through the Court. In 2015, Nigerians knew what transpired in Imo. The State was invaded with armed Security Personnel by the PDP leaders like Chief Uzodinma and the rest is history.” Okorocha’s view was that, “ Chief Uzodinma can never win election in Imo in a fee and fair election. And that is why the PDP and APGA members are those celebrating his K – leg governorship Candidature for Imo APC. 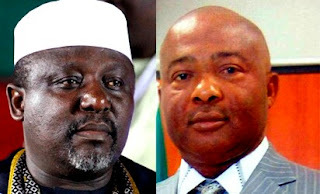 “Since Chief Uzodinma has begun to throw stones, not considering the fact that he lives in a badly constructed glass house we challenge him to publish his profile for the public to see and let Rochas also publish his own. “Rochas Okorocha was born in Ogboko and he grew up in Jos. He attended St. Joseph Primary School, Barkin Ladi Jos, and Juladaco High School Jos. He has LLB and LLM of the University of Jos, Post – Graduate Diploma in Management, of the Benue State University. “By 1984 Rochas Okorocha had opened Kings Commercial College Jos. In 1996, he founded the Rochas Foundation Inc and Rochas Foundation Colleges. He founded the Rochas Group of Companies with interest in Real Estate, Aviation, Banking, Hotels, Construction, Commerce and so on. “Rochas Okorocha has investments and Commercial buildings in Imo before becoming governor. He has two Rochas Foundation Colleges, one in Owerri and one in Ogboko. Has a Printing Press, and a Hotel. Has some of the biggest Commercial buildings in Owerri, and all before becoming governor. “Let Chief Uzodinma mention any building he owns in Owerri or any investment he has in any part of the State no matter how small, then we take off from there.